Get in the best shape of your life with the indoor and outdoor body blitz boot camps. All ages and fitness levels welcome. 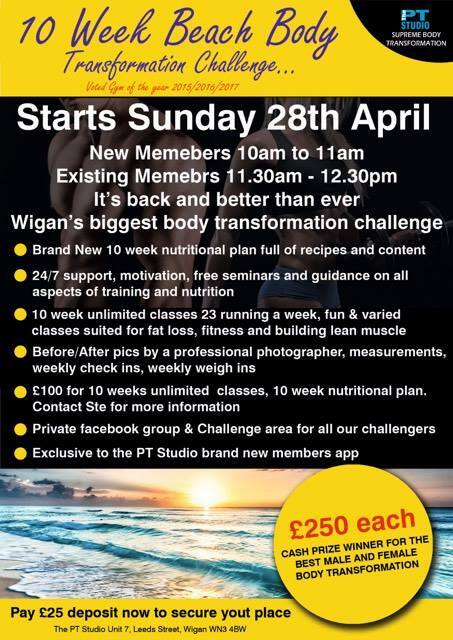 Every week day at The PT Studio, Wigan. Click HERE for more details. See some testimonials from our members. Make a better YOU. YOU version 2.0 is just around the corner. Find your FIT – There are classes for all abilities and levels of fitness. Advanced Personal Trainer, based in Wigan and featured on TV!Where we put our client’s needs first. The PT Studio is not just a gym! It is an EXCLUSIVE Personal Training Studio located in the Wigan area AS SEEN ON TV and also offers body blitz boot camp classes, boxing fitness classes and Spartan Warrior Strength and conditioning workouts. The Studio was created for our clients. It is private and focuses on YOU, YOUR needs, YOUR body and mind using tried and tested methods and results based training. Members enjoy a wide range of unique exercises and therapy systems which are taught at the highest levels helping them achieve their personal goals. Our training is driven by our great team of trainers and advanced nutritionists to give our members the best chance of success. All the methods used by us are current, evidence-backed and will deliver the results you are after. If you are tired of not getting the results you want, then the PT studio can help. Click Team PT above, to learn about our team. For a FREE consultation call 07506673955. Do it today and get in the best shape of your life!